I was a kid who loved salads and I have my mom to thank for that – I was never the kid who pushed the arugula leaves to the side of the plate, much to the contrary: I was the kid who would eat a tomato as someone would eat an apple between meals. But a whole new world opened up to me when I started collecting cookbooks: it was then that I learned that the salads I already loved could become even more interesting and delicious, that I could add fruit and cheese and nuts to my salads and they would be not only more flavorful but also more nutritious. 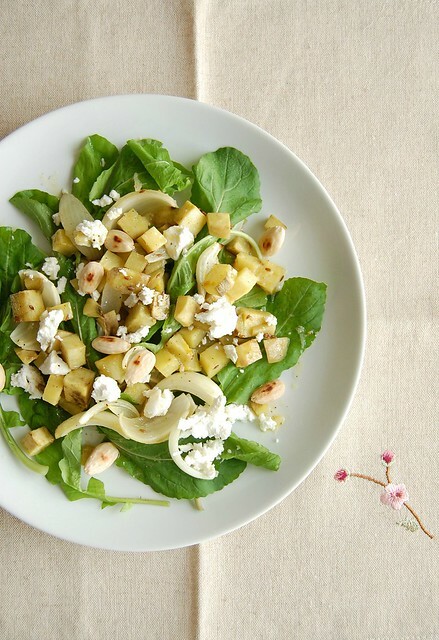 This beautiful salad, absolutely yummy and filling, was slightly adapted from Lucas Hollweg’s stunning cookbook – a book I plan on using to exhaustion. Preheat the oven to 180°C/350°F. Place the almonds in a small baking sheet and toast until fragrant and golden, stirring once or twice, 6-8 minutes. Set aside to cool completely (leave the oven on). Peel the sweet potatoes and cut into 2cm chunks. Place in a roasting pan, add the onions, cumin, garlic and orange zest. Drizzle with 2 tablespoons of the olive oil, sprinkle with salt and pepper and toss to combine. Roast for 35-40 minutes, turning them over halfway through, or until sweet potatoes and onions are tender. Set aside to cool completely. Remove the garlic and remove the pulp out of the skins. Transfer pulp to a small bowl and mash with a fork. Add the orange juice, lemon juice, salt, freshly ground black pepper and mix well. Mix in 2 tablespoons of the olive oil. Arrange the arugula leaves in the plates and scatter with the sweet potato mixture. Sprinkle with the almonds and scatter around the goat cheese pieces. Drizzle with the dressing and serve at once. It's a shame, that I can't never get the sweet potatoes here in Denmark, but I could grow Them my self. But lovely recepie, have a wonderful weekend. Sweet pototatoes are a new favorite of mine, what a lovely salad! I hated salads when I was little, but love them now. This looks really tasty! Where did you get sweet potato that looks so pale? Round here it's always rather orange. This was tasty enough, thanks! Though I skipped the orange juice - not a flavour I like in salads. I'm glad to know you liked the recipe - tks!